Download "Group Long Term Disability Insurance"
2 The following is a brief description of some of the coverage highlights for the California State University LTD Insurance plan underwritten by Standard Insurance Company. More detailed information appears in the Certificate Of Insurance you will receive should you become insured, including the full text of definitions, exclusions, limitations, reductions and terminating events that apply to your coverage. However, the controlling provisions are contained in the Group Policy and neither this summary, nor the certificate, may modify those provisions or the insurance in any way. If you have additional questions, please access In the material that follows, the initial letters of the Group Policy s defined terms are capitalized. Eligibility To become insured you must: (a) Be a Member; (b) Complete your Eligibility Waiting Period; and (c) Meet the requirements in Active Work Provisions and When Your Insurance Becomes Effective. You are a Member if you are a) an active employee of the Employer, b) a citizen or resident of the United States or Canada, and one of the following: Appointed half-time or more for more than six months in an executive, management, supervisory, bargaining unit 4, bargaining unit 3 (excluding Faculty Early Retirement participants), or bargaining unit 1 position; or Appointed for at least six (6) weighted teaching units or more for at least one semester or two or more consecutive quarter terms in a lecturer or coach academic year position (Unit 3). 4 you are required to be Disabled only from your Own Occupation. You are Disabled from your Own Occupation if, as a result of Physical Disease, Injury, Pregnancy or Mental Disorder, you are unable to perform with reasonable continuity the Material Duties of your Own Occupation. B. Any Occupation Definition Of Disability After the end of the Own Occupation Period you are required to be Disabled from all occupations. You are Disabled from all occupations if, as a result of Physical Disease, Injury, Pregnancy or Mental Disorder, you are unable to perform with reasonable continuity the Material Duties of any gainful occupation for which you are reasonably fitted by education, training and experience. C. Partial Disability Definition 1. During the Benefit Waiting Period and the Own Occupation Period, you are Partially Disabled when you work in your Own Occupation but, as a result of Physical Disease, Injury, Pregnancy or Mental Disorder, you are unable to earn 80% of your Predisability Earnings or more. 2. During the Any Occupation Period, you are Partially Disabled when you work in an occupation but, as a result of Physical Disease, Injury, Pregnancy or Mental Disorder, you are unable to earn 80% of your Predisability Earnings, or more, in that occupation and in all other occupations for which you are reasonably fitted. 5 Schedule of Insurance If you become Disabled while insured under the Group Policy, we will pay LTD Benefits according to the terms of the Group Policy after we receive satisfactory Proof Of Loss. LTD Benefit Executive Members: 66 2/3% of the first $22,500 of your Predisability Earnings, reduced by Deductible Income. All other Members: 66 2/3% of the first $15,000 of your Predisability Earnings, reduced by Deductible Income. Maximum LTD Benefit Executive Members: $15,000 before reduction by Deductible Income. All other Members: $10,000 before reduction by Deductible Income. Minimum LTD Benefit $100 LTD Benefits become payable after you have been continuously Disabled for the entire Benefit Waiting Period. Thereafter, during the Maximum Benefit Period, LTD Benefits are payable at the end of each month for which you qualify for LTD Benefits. The Benefit Waiting Period is the first 180 days of each continuous period of Disability, beginning on the date you become Disabled. No LTD Benefits are payable during the Benefit Waiting Period. 6 Your Maximum Benefit Period is determined by your age when you become Disabled. If you become Disabled prior to age 61, the Maximum Benefit Period ends at age 65. An age-graded schedule applies if you become Disabled on, or after, age 61. No LTD Benefits are payable after the end of the Maximum Benefit Period, even if you are still Disabled. Deductible Income Your LTD Benefit is reduced by other income you receive or are eligible to receive because of your Disability. Deductible Income includes, but is not limited to, sick leave or other salary continuance, Workers Compensation Benefits, Social Security benefits, state disability income benefits, benefits from your Employer s retirement plan and your Work Earnings. See your Certificate for more details. Limitations You must be under the ongoing care of a Physician during the Benefit Waiting Period and while LTD Benefits are payable. No LTD Benefits are payable for any period of Disability when you are not under the ongoing care of a Physician. Payment of LTD Benefits is limited to 24 months for each period of Disability caused or contributed to by a Mental Disorder. However, if you are confined in a Hospital at the end of the 24 months, this limitation will not apply while you are continuously confined. 7 Exclusions You are not covered for a Disability caused or contributed to by: War or any act of War; an intentionally self-inflicted injury, while sane or insane; or a Preexisting Condition or medical or surgical treatment of a Preexisting Condition unless, on the date you become Disabled, you have been continuously insured under the Group Policy for at least 12 months, and have been Actively At Work for at least one full day after the end of those 12 months. A Preexisting Condition means a mental or physical condition for which you have consulted a Physician, received medical treatment or services, or taken prescribed drugs or medications during the 90 day period just before the effective date of insurance under the Group Policy. When LTD Benefits End LTD Benefits end automatically on the earliest of: The date you are no longer Disabled The date your Maximum Benefit Period ends The date you die The date benefits become payable under any other group long term disability insurance policy under which you become insured during a period of Temporary Recovery When LTD Insurance Ends Your LTD Insurance ends automatically on the earliest of: The date the Group Policy terminates; The date your employment terminates; and The date you cease to be a Member. 8 Other Plan Provisions Survivors Benefits If you die while LTD Benefits are payable, a Survivors Benefit Amount will be paid as follows: If you have received LTD Benefits for at least 12 months; the amount of the last LTD Benefit paid to you will be paid to your eligible Survivor for 12 months after your death; or 3 times your LTD Benefit without reduction by Deductible Income will be paid, whichever of the two are greater. 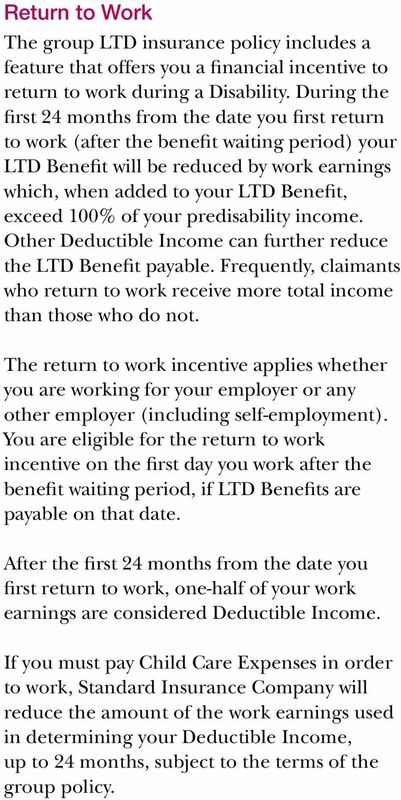 If you have not received LTD benefits for at least 12 months, you will be paid 3 times your LTD Benefit without reduction by Deductible Income. Conversion When your employment terminates, you may buy LTD conversion insurance if on the date your employment terminates: you were insured under your Employer s long term disability insurance plan for at least one year; you are not Disabled; you are a citizen or resident of the United States or Canada; and you apply in writing and pay the first premium for LTD conversion insurance within 31 days after your insurance ends. Reasonable Accommodation Benefit If you are Disabled and return to work in any occupation for any employer, not including self employment, as a result of a reasonable accommodation made by such employer, we will pay that employer a Reasonable Accommodation Expense Benefit equal to the expenses incurred for the reasonable accommodation or $25,000, whichever is less. The Reasonable Accommodation Expense Benefit is payable only if approved by The Standard in writing prior to its implementation. 9 Return to Work The group LTD insurance policy includes a feature that offers you a financial incentive to return to work during a Disability. During the first 24 months from the date you first return to work (after the benefit waiting period) your LTD Benefit will be reduced by work earnings which, when added to your LTD Benefit, exceed 100% of your predisability income. Other Deductible Income can further reduce the LTD Benefit payable. Frequently, claimants who return to work receive more total income than those who do not. The return to work incentive applies whether you are working for your employer or any other employer (including self-employment). You are eligible for the return to work incentive on the first day you work after the benefit waiting period, if LTD Benefits are payable on that date. After the first 24 months from the date you first return to work, one-half of your work earnings are considered Deductible Income. If you must pay Child Care Expenses in order to work, Standard Insurance Company will reduce the amount of the work earnings used in determining your Deductible Income, up to 24 months, subject to the terms of the group policy. 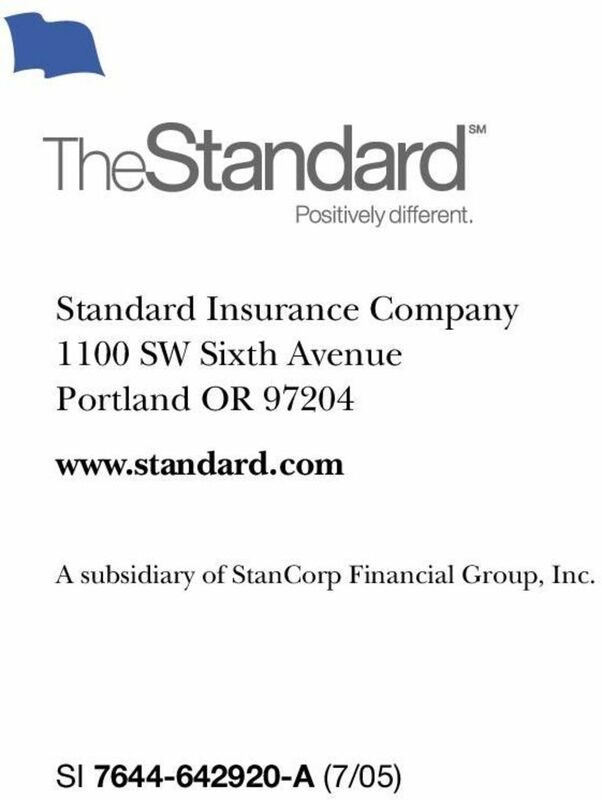 10 About Standard Insurance Company Standard Insurance Company has earned a solid reputation for its quality products, expert resources, superior service, steady growth, innovation and strong financial performance. 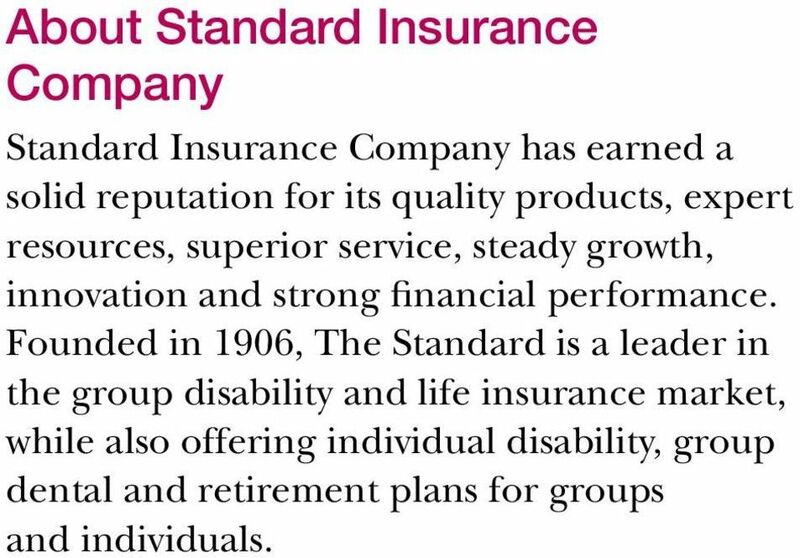 Founded in 1906, The Standard is a leader in the group disability and life insurance market, while also offering individual disability, group dental and retirement plans for groups and individuals. Group Basic Life and AD&D Insurance City & County of Denver S T A N D A R D I N S U R A N C E C O M P A N Y City & County of Denver Group Basic Life and AD&D Insurance WHAT ARE MY BASIC LIFE AND AD&D BENEFITS? Section D Long Term Disability (LTD) Insurance Section Page When Coverage Begins...D. 1 When Coverage Terminates...D. 1 What are the Benefits...D. 1 Duration of Benefits...D. 2 What is Total Disability...D.
WHY WOULD I NEED IT? HOW MUCH DO I NEED? 1 LTD (Long Term Disability Plan) 2.1 Eligibility (a) (1) Regular full-time employees shall be covered by the Long Term Disability Plan upon completion of six months active employment with the Employer.